A popular Nigerian comedian, Gordons, whose real name is Godwin Komone, on Saturday gave ribs-cracking jokes as he spoke on his gift of comedy. 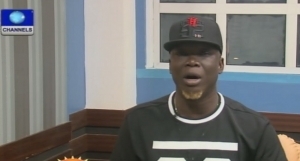 His popular series Comedy Clinic has recorded huge patronage in different part of Nigeria, with commercial buses using it as a means of entertaining passengers travelling to different areas of the nation. He said that his parents wanted him to study medicine, but that they now contribute to his career by giving him jokes. “I have the gift of comedy and it is comely to me. “A lot of us are victims of our parental choices. They wanted me to read medicine actually,” he said. He has a degree in Integrated Science after an attempt to study medicine failed. He said: I am still a doctor but i practice through ‘Comedy Clinic’. On how he has been able to achieve fame through comedy, he said: “I first build the stage of the people backward. I entertain them in my mind before I come out. I do it mentally back home. “I read a lot. Any book. Comedy is an idea. You get it, polish it and make it funny. You don’t have to crack joke you just have to make it funny. “From my morning devotion I should be able to receive inspiration God will give me and from a very casual story I could be able to get jokes out of it. “If you must replenish the earth you must come out with something that must affect the earth,” Gordons said.